Modesty doesn’t have to mean you’re covered from head to toe and sweating bullets. And putting your style on display doesn’t mean you have to put everything about you on display. Maintain your modesty and your fashion sense by wearing these modest and stylish summer trends. There are so many things to love about modest maxi length skirts and dress. They’re conservative yet fashionable. They’re easy to dress up or dress down. They’re flowy and breezy. You don’t have to shave when you wear one. Plus, you can find several stretchy styles that you can wear before, during and after pregnancy. A gorgeous trend right now is the boho maxi dress. You’ll find lots of low hemline options in fresh colors and pretty florals with ruffles and all things feminine. While midi and maxi lengths are in and available in every store and online boutique, summer styles like to trend toward shorter and shorter hemlines. But that doesn’t mean you can’t buy that cute summer dress that’s a couple inches too short for your comfort. All you need is a skirt or dress extender slip. It adds the length you need (and a little pop of color or texture adding more style to your look. While tight, skinny denim is the reigning pant style as of now, tight and skinny pants are not what you want to be wearing when it’s 80 degrees or hotter outside. You want palazzo pants, and we’re seeing more and more of these loose, wide-legged pants hitting stores for spring and summer. They’re especially trending in lighter-weight fabrics and cropped bottoms, which is a great style for all of you tall gals. The wider legs allow for just the right amount of airflow to keep you cool on a hot summer day. Pair wide leg pants with a more fitted top to help balance out your flouncy, chic summer look. Any woman who’s on the more conservative side of dressing knows a good undershirt goes a long way and can work its way into a number of outfits. 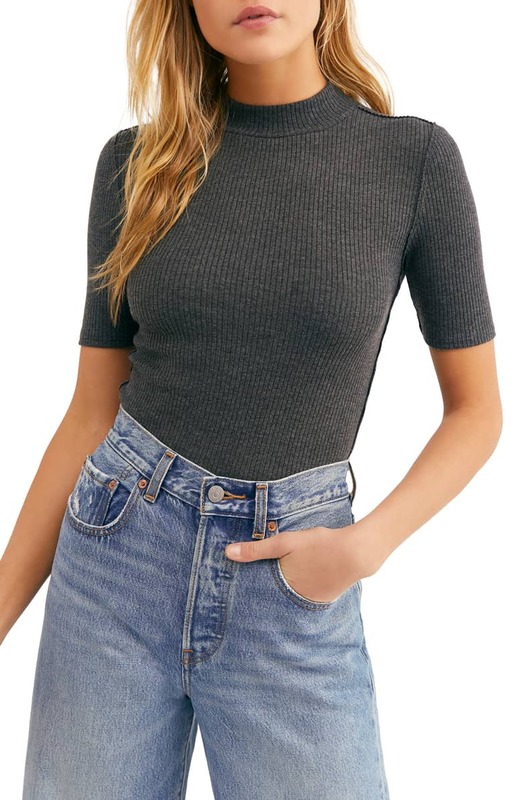 This year, while basic tees and tanks still work, the ribbed mock turtleneck will be the go-to undershirt for many. It’s cute, and unlike those v-neck tees, it keeps your chest covered no matter how you move around. Mock turtlenecks are also versatile. You can wear one underneath strapless dresses, jumpers, jumpsuits, and overalls, or you can wear it alone tucked into a pair of high waisted pants. 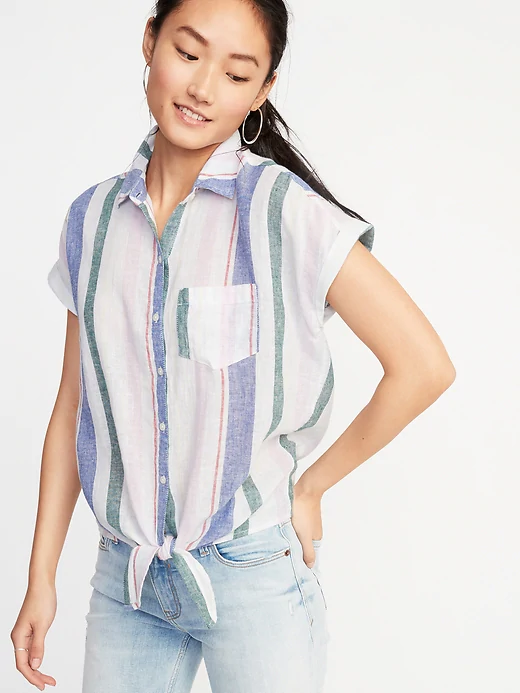 Button-front skirts, dresses, and shorts are trending this summer—so are button tie-hem shirts. From the lightweight, cool fabrics to the relaxed fit and all the adorable patterns out there, this is the perfect style for all of you on-the-go summer girls. And that front tie detail? It’s such a simple detail but also such a cute one. I know. You hear blazers and you’re probably thinking of a thick, black blazer that you’d wear into the office. But a relaxed, casual and lightweight blazer is a must-have wardrobe addition this summer, whether it’s white, a solid vibrant color or patterned. It’s great when an outfit requires extra coverage. Summer blazers also add a touch of smart elegance to your outfit while keeping you warm on those chilly summer nights. Long sleeves? In summer? Yes, you read that right. 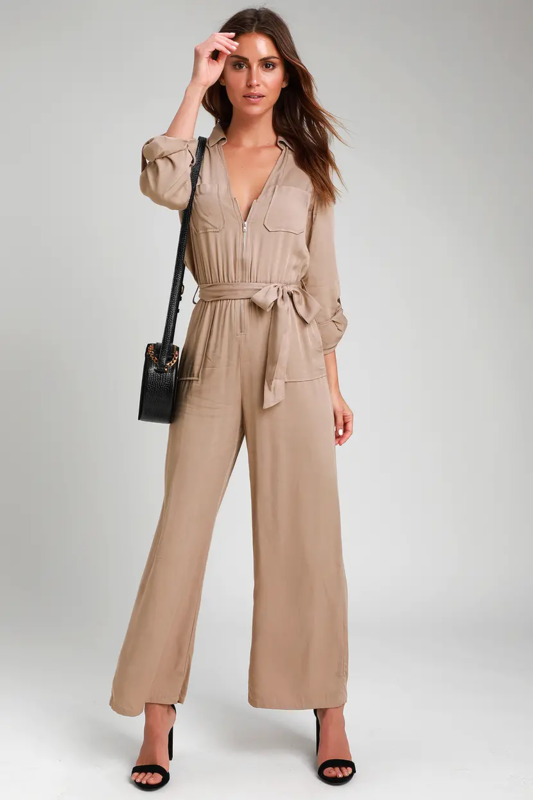 Long-sleeved jumpsuits, especially utilitarian designs, are a big fashion trend for spring and summer this year. And let me tell you, besides a good pair of lightweight joggers, there’s nothing comfier than a good jumpsuit in the right material. And it takes the guesswork out of finding a matching top and a bottom. Your entire outfit is in one piece ready for you to throw on and walk out the door confidently covered. Plus if you think about it, a thin long-sleeved jumpsuit is cooler than wearing layers.